As we read earlier, when people began to farm and keep herds of animals, it became possible for them to come together in larger groups and work on projects other than gathering food. In Mesopotamia and Egypt, people began to build towns and cities. Far to the west in Britain, France and Spain, Neolithic people did not build big cities, but they did begin to build large monuments out of stone. Between 4,000 and 3,000 B.C. (while Uruk was being built far to the East) people in Britain began to build giant tombs for their dead called long barrows. First they built a long house or hall-shaped structure out of wood or giant slabs of stone. Then they piled huge mounds of earth on top, making a long narrow hill that stood 12-15 feet high and as much as 300 feet long. Inside these long tunnels they buried their dead, sometimes as many as fifty in a single barrow. Why did they do this? We do not know. The Neolithic peoples in Western Europe did not invent writing, so they had no way to tell us what they thought about the world. The barrows certainly made impressive landmarks. Perhaps building the giant barrow helped them show how important their ancestors were to them. Long afterwards people wondered what the barrows were for. Often they feared that they were haunted by ghosts and goblins. Between 2800 and 2600 B.C., a new people came to Western Europe. Archeologists call them the Beaker People because they often buried decorated clay pots called beakers with their dead. The Beaker People learned to smelt copper and bronze, and they eventually began to trade with the peoples in Anatolia and Mesopotamia, bartering tin from Britain in return for exotic goods from the East. They learned to build giant stone monuments from the people were lived in Western Europe before them, but they did not build long barrows. Sometimes they still built large tombs for their dead, but in the Bronze Age people were usually buried their own tombs, rather than in one large tomb with many lots of people. Very important people were buried under large mounds of earth with gold jewelry and bronze weapons and tools. However the most famous monuments these Bronze Age people built are called henges. 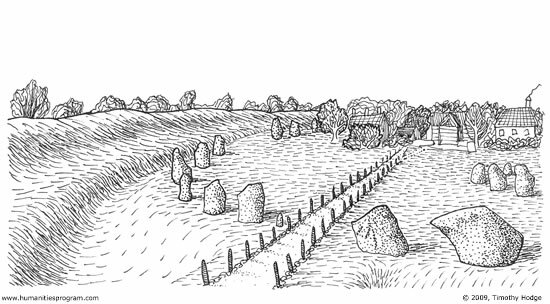 A henge [henj] is a monument made of giant standing things. Most henges were made using giant wooden beams (wood henges) or giant stones (megaliths). [meg-uh-liths]. You have probably heard of Stonehenge, a megalithic monument built on Salisbury plain in England. Stonehenge was made of a ring of thirty standing stones about thirteen feet high with thirty more giant flat stones laid on top of them to make a sort of covered ring. Just standing these stones up must have been a tremendous amount of work for people who did not have cranes and tractors, but that was not all they had to do. 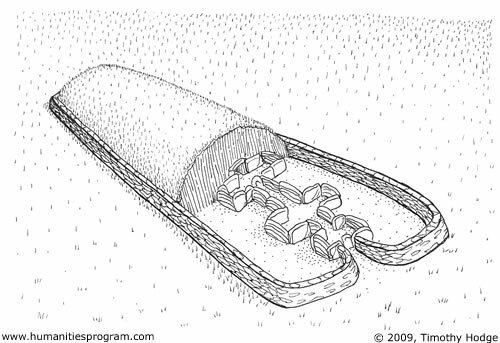 The stones were dug out of a quarry twenty-five miles away and dragged to the site on giant rollers made out of logs. It must have taken a lot of people to do all that work. Each of the standing stones weights 25 tons! Inside that ring of stones is a smaller ring of standing stones. They are only six feet high and weigh only four tons, but they came from even farther away -- over 150 miles. You can see the full layout of Stonehenge in this picture. We do not know for sure why Stonehenge was built, but many archeologists believe that it was used as a giant religious calendar. 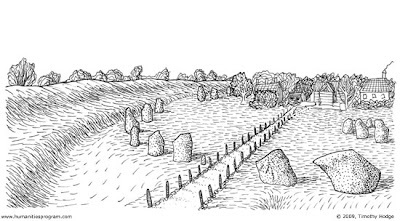 The stones were arranged so that when the sun rose on the summer solstice, it would shine through a pair of standing stones placed outside the circle and right onto a single standing stone that was in the middle of the circle. The summer solstice (Midsummer Day) marked the day on which the sun reached its northernmost position in the sky and was also the longest day of the year. If the Beaker People considered the sun to be some sort of god, the solstice might have been a very important day for them. There are other henges and groups of standing stones that can be seen throughout Britain, France and Spain, although Stonehenge is the most famous. 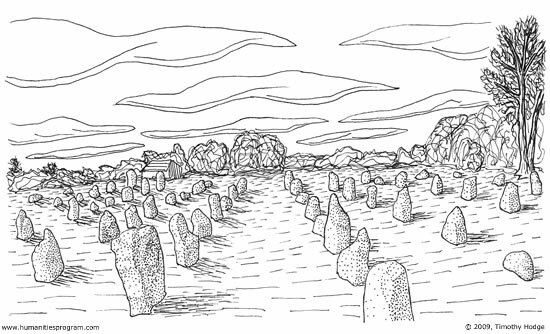 There is a set of standing stones arranged in circles at Avebury which is so large that part of a town is now built inside it. Around the town of Carnac in France, there are several large, rectangular arrangements of standing stones which Neolithic people erected in long, straight rows.